Founded in 1977, we are a monastic community for women of the Orthodox Church in America. We have been situated since 1983 in Otsego County in the scenic upper-Catskill region of New York State. We have been members of the Cooperstown Chamber of Commerce and are honored to be part of Central New York's "Leatherstocking Country." From our monastery's Typicon: Inspired by the desert mothers and fathers, we model our lives as fully as possible on their life and witness, their martyria. We are called to be Orthodox Christian monastics in our own time and place as surely as they were. Jesus Christ is the same yesterday, today and forever. We are aware that the world around us is very different from the one they knew. We have the responsibility to balance our obligations to this world of noise and technology with our calling to choose to grow into the greater silence and simplicity of their lives. As they were, we also are obedient to the doctrinal and sacramental structure of the Church. 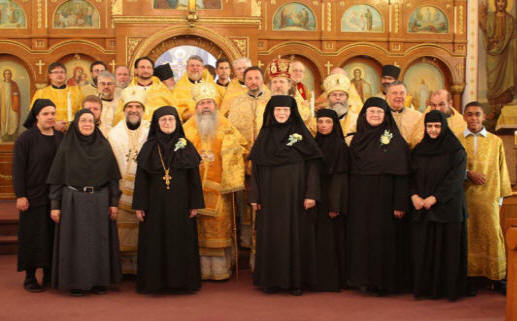 Drawn from all Orthodox jurisdictions, we are a stavropighial monastery under the Metropolitan and the Holy Synod of the Orthodox Church in America, witnessing to the unity we share in Christ. Within the monastery's framework of daily liturgical and personal prayer, we work as farmers, artists and craftsmen. We offer the result of our own labors, here and in our regular catalog that goes out through the regular mail once a year. If you would like to receive our regular mail catalog (as well as our newsletters) and are not already on our mailing list, send us your address by clicking here. We also offer a few selected items that are not products of our monastery or farm, such as embroideries from Palestine and recordings of liturgical music. Some are offered only through our Online Catalog. Above is a photograph taken at Dormition Church, Binghamton, NY on August 25, 2012 following the hierarchical Divine Liturgy in celebration of our monastery’s 35th anniversary, our abbess’s 40th anniversary of life profession and Mother Michaela’s 50th. We will soon be posting a page devoted to this celebration. On occasion we host Pilgrimage Days: Our Patronal Feast of the Myrrhbearers begins on the second weekend after Pascha each year and continues through the following Saturday “Leave-taking.” See Annual Monastery Events. “The Myrrhbearers are the women who went to the Tomb of Christ carrying myrrh and other spices to anoint His dead body. On finding instead an empty tomb, they were the first to preach the Resurrection. In the Orthodox Church they are called "Apostles to the Apostles; the First Preachers of the Resurrection."